In a recent post (“Now Let’s Murder Klimt”, 5 June), we let photographs speak for themselves on the widespread debilitation of Klimt’s paintings at the hands of picture restorers. Here, we discuss the precision – and the consistency – with which the surviving photographic record of his oeuvre testifies to a progressive and irreversible deconstruction of the artist’s original statements. Above, Figs. 1, 2 and 3: Susanna Partsch’s book and (Fig 3) the detail of Klimt’s 1907-08 Danae as published in Emil Pirchan’s 1956 Gustav Klimt, Bergland Verlag Wien. The above and all succeeding multiple photo-compilations were assembled by Gareth Hawker, who drew our attention to Sickert’s letter below. Above, Figs. 4 and 5: a detail of a large detailed illustration in the 2007 book Gustav Klimt, edited by Alfred Weidinger. The illustration shown above in colour and in greyscale (Figs. 4 and 5) appears on p. 190 of the 2007 book Gustav Klimt and faces a sub-part by Susanna Partsch of a section headed “On Flowers in Bloom and Radiant Women”. Given that this photograph was likely taken in preparation for the book (see below), the question arises: What accounts for the differences between this image and that used on the cover of Susanna Partsch’s own book the following year? Were they both derived from the same photograph but with the image on the book cover having been digitally manipulated by a designer to heighten the saturation of colours so as to increase graphic force and “attractiveness”? Or, is the image in the slightly earlier book made from a somewhat later photograph? 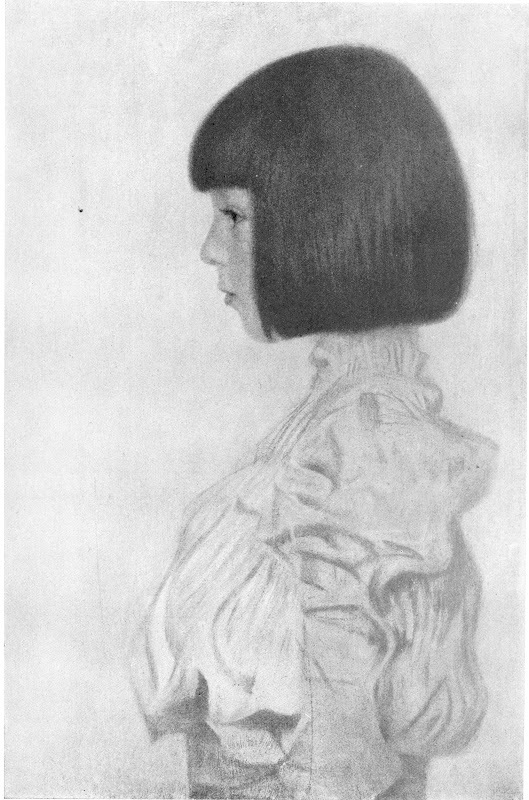 If, when comparing individual photographic reproductions, such problems arise from insufficient knowledge of their origins and handling, what can be seen as clear as day when surveying the Klimt literature is that the earliest photographs and the most recent depict works in profoundly different states. If presently we cannot for logistical reasons hunt down the pedigree, the history and the reproductive variations of every Klimt image-in-public-circulation, we can with confidence flag-up some of the glaring discrepancies of testimony that are encountered in the photo-records of the artist’s individual works. These discrepancies urgently need to be addressed. Unfortunately, it is no longer possible to let Klimt’s paintings speak for themselves. In barely more than a century, his works, like those of many other modern artists, have been traduced by restorers (see Taking Renoir, Sterling and Francine Clark to the Cleaners). 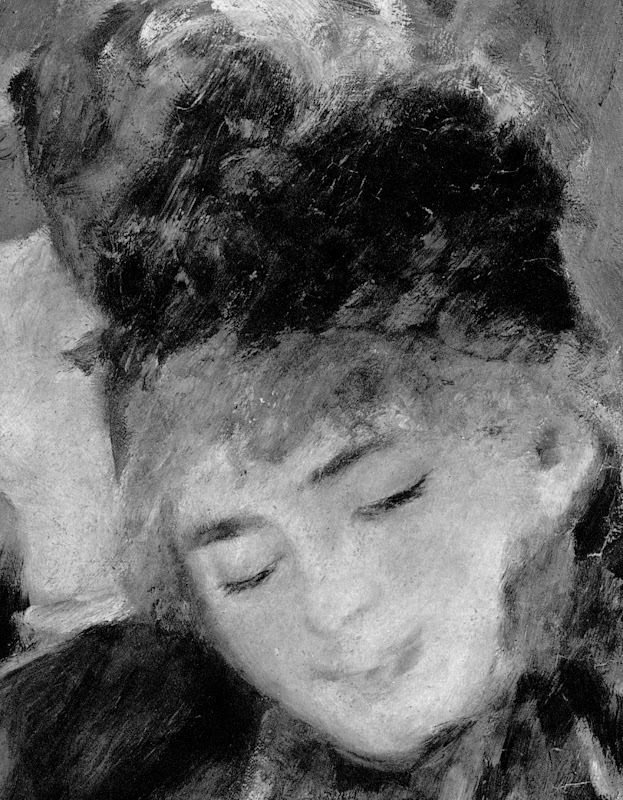 The Klimt literature is rich in photographs showing his paintings when new and unspoiled but scholars seem persuaded that today’s photographs offer the best record of his work even though early photographs make it easy to identify subsequent restoration injuries – and even though nothing could be simpler or more to the point for art critical purposes than comparing old and recent photographs [Endnote 1]. This apparent aversion to the historic visual record is perplexing in two respects. First, in all contexts other than art restoration there is grateful acceptance of photographic testimony by scholars. Attributions are made on the evidence of photographs. Art dealer/sleuths hunting attribution upgrades buy works on the strength of online photographs . Paradoxically, as today’s scholars effectively turn a collective blind eye to restoration injuries, restorers are seeking permission to declare their errors on a “without-liability” basis . 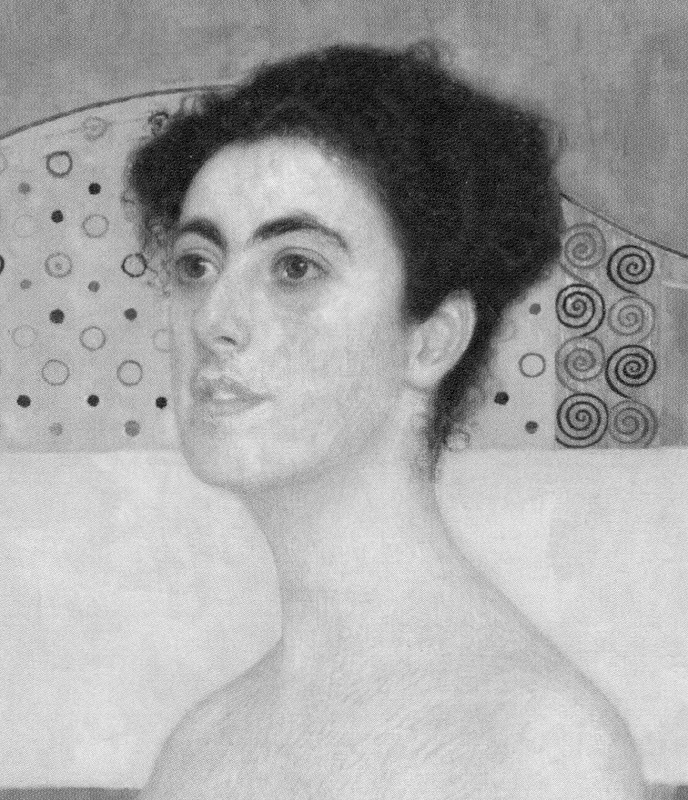 Second, by not noticing – or sometimes seemingly flaunting – patently injured works, Klimt scholars betray the artist and sell the public short. The detail carried as a book cover illustration at Figs. 1 and 2 is of a horrendously mutilated painting that no longer functions as Klimt had intended. In a world where art mattered for what it is, not for what might be said about it and its backstory, scrubbing paintings to the point where under-drawing emerges would properly count as a crime against art, if not in law, and the restorers, owners, curators, sponsors and trustees responsible for dimishing and adulterating its content would be censured, not celebrated. A curator should wipe, but he must not flay. Galleries should be dry, but not too dry. They should be warm, but not hot. On Friday, Dec. 18, the rain was being captured in pails as it dripped from the skylights of the National Gallery. Perhaps money had better be reserved for the integrity of ‘the fabric’. 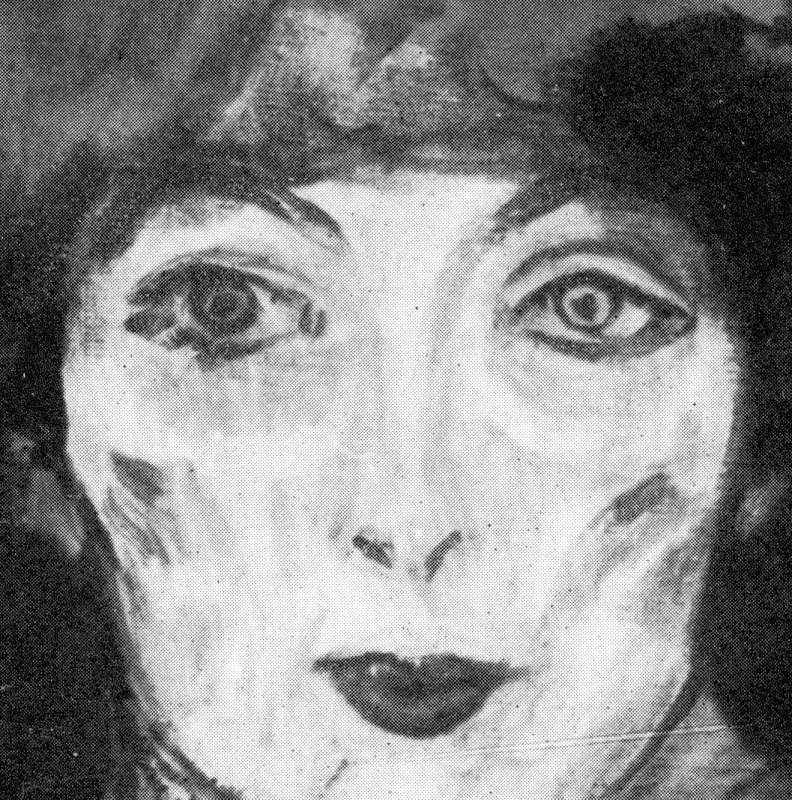 To help identify Klimt’s original purposes in today’s hyper-active conservation world it is essential to study the photographic record of his works, as with, for example, the unfinished 1917-18 Portrait Head of a Lady below. The detail at Fig. 6 (top) is from the work as published in Werner Hofmann’s 1972 Gustav Klimt. The detail at Fig. 7 (middle), is from the work as published in the catalogue to the above-mentioned “Gustav Klimt” exhibition at the Isetan Museum of Art, Tokyo. The detail at Fig. 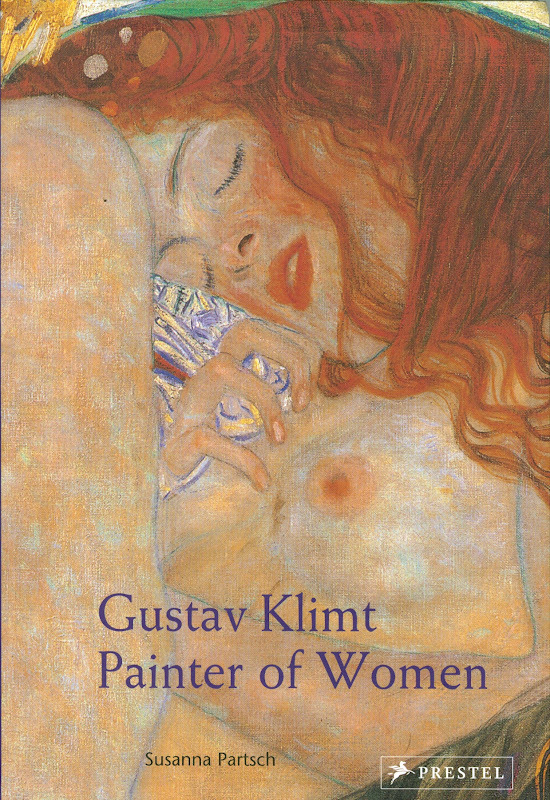 8 (above) shows the work as published in the 2012 book Gustav Klimt ~ The Complete Paintings. Do the startling differences seen above not speak of injury to the painting? If such (apparent) changes in paintings were illusory products of the vagaries of photo-reproductions, reproductions would come and go in their narratives, leaning a bit this way one minute; a bit the other way the next. Some changes certainly are of that order (and particularly so in terms of colour fluctuations) but others are simply too great to be reproductive variations. Moreover, the wider photo-record contains recurrent patterns of change and these are seen to run across the histories of individual works and entire oeuvres alike. Patterns are always significant and eloquent. In the particular recurring pictorial pattern of concern here, paintings become lighter, brighter, thinner and flatter with successive restorations. (See Figs. 9 and 10, and Figs. 17 and 18 for non-Klimt, single-restoration examples.) A rigorous examination of patterns provides a helpfully focussing diagnostic method. If paint losses are not occurring, why should the net effect of picture cleanings be to compress relationships and minimise values rather than to widen and enrich them? 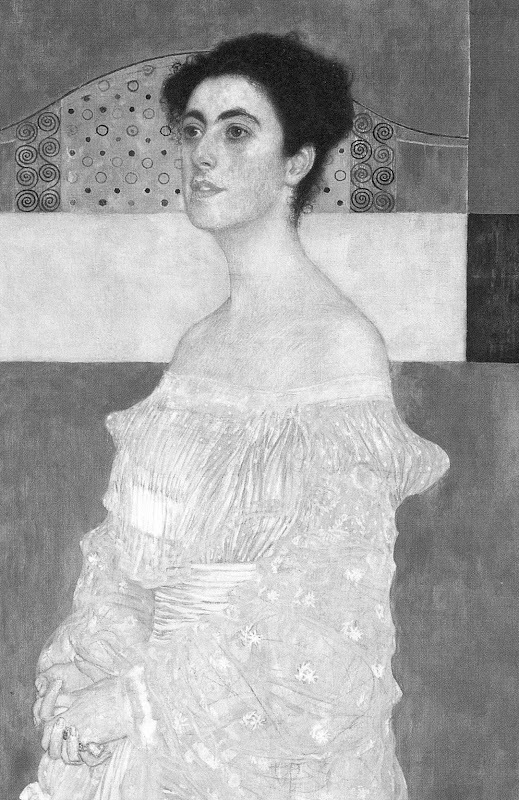 With this particular unfinished Klimt painting, the most dramatic change occurred prior to 1981 and yet, after over a third of a century and very many more photographic reproductions, no subsequent image has resembled its pre-1981 predecessor – those recorded differences have proved permanent and irreversible. Notwithstanding the promise of one restorer in the US to “make your paintings look as good as new – or better”, no restoration can recover what has been lost. In aggregate, art restoration is a one-way street that runs away from authenticity, original conditions, and artists’ express intentions. Shortly before the abruptly changed state of the painting seen at Figs. 7 and 8 was published, the picture had been sent from Linz to Tokyo. Loaned works are often “restored”, “put in order” and made to “look their best”. “Putting in order” often includes “lining” or gluing an additional new and reinforcing canvas to the back of the painting. The bond between the two canvases is usually achieved with glues or waxes and hot irons in a notoriously hazardous procedure that was condemned by restorers themselves in the 1970s. Supposedly ameliorative or “preventive” procedures often produce disastrous material and aesthetic changes with first-time restorations. Scholars rarely nowadays discuss such consequences and seem not to notice, even, when paint is removed from the most vulnerable and exposed parts of the picture surface leaving rows of white dots along lines of canvas weave. Such can clearly be seen to run across mid-tone and dark passages alike at Fig. 8. Restorers euphemise such losses as “abrasions” when what most “abrades” paint is solvent-loaded swabs. The inner corner of the eye on the left of Klimt’s painting (Fig. 6) was formerly marked by two short vertical dark accents. As seen in Figs. 7 and 8, by 1981 those marks had been reduced to a single patch of lighter tone. No photograph or reproductive variation could produce such an alteration. 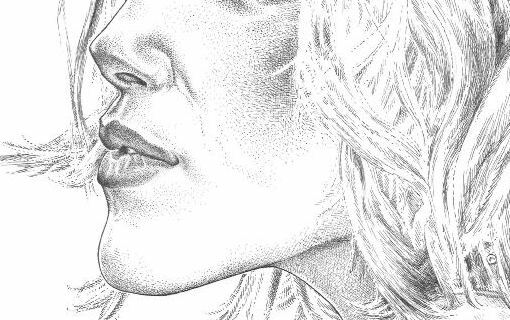 The lips too became lighter and less clearly drawn and modelled. Presumably, good photographic records survive of all treatments to this late unfinished but important work in which Klimt’s working transition from drawing to paint on canvas can be studied? With the losses of a comparable magnitude seen on the Renoir below (Figs. 9 and 10), there can be no question about the veracity of the photographic record. Above, Figs. 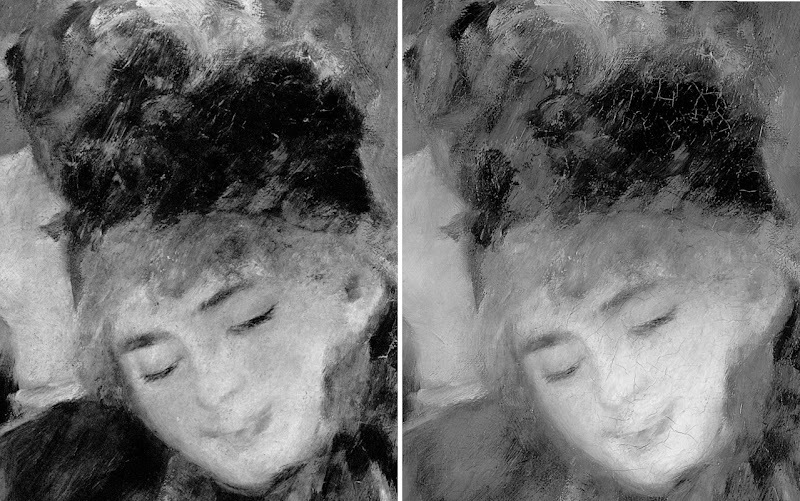 9 and 10: A detail of Renoir’s Umbrellas before cleaning (top) and after cleaning at the National Gallery. The two photographs above were made at and by the National Gallery immediately before and immediately after cleaning. The evidence of injury is manifest and our claims on it have never been contested. But again, so far as we know, no Renoir scholar has ever addressed these losses. With this painting we know when, by whom and with what materials the damages were made: the National Gallery has given us full access to its picture treatment records and those disclose that prior to this restoration the only cracks present in the painting occurred along the line of a horizontal central stretcher bar against which the canvas vibrated during its regular travels to and from Dublin. The extensive cracking that emerged on the face was entirely attributable to the conservation “treatment”. If scholars are reluctant to discuss restoration damage for fear of upsetting owners (public or private), it is less understandable that they should defer to the professional claims of restorers. When picture restorers insist that the testimony of photographs is not to be trusted they betray professional hypocrisy. Restorers make great use of photography for their own promotional purposes – as when (routinely) claiming some restoration “discovery” or “recovery”. They also use old photographs of works to guide their own repainting of losses incurred during a cleaning. On these occasions no health warning against an inherent unreliability of photography is ever issued. Restorers have now enjoyed criticism-free positions for so long in museums that they lay unchallenged claims to special technical expertises and powers of divination on the authority of which they feel entitled to determine how works of art should “be presented”. They freely admit that they restore works differently from one another and, yet, contend that all of their various improvisations on art are co-equally legitimate, providing only that they are “safely” executed. They do not explain how various impositions of “interpretive alteration”, might all somehow be artistically and historically tenable. It is time curators called their bluff. Occasionally scholars do discuss old photographs and do accept the veracity of their testimony. In the above-mentioned 2007 book Gustav Klimt, the catalogue of works includes an entry on Klimt’s Portrait of Margaret Stonborough-Wittgenstein. It carries a 1905 photograph of the painting next to a recent photograph (see Figs. 11 and 12). 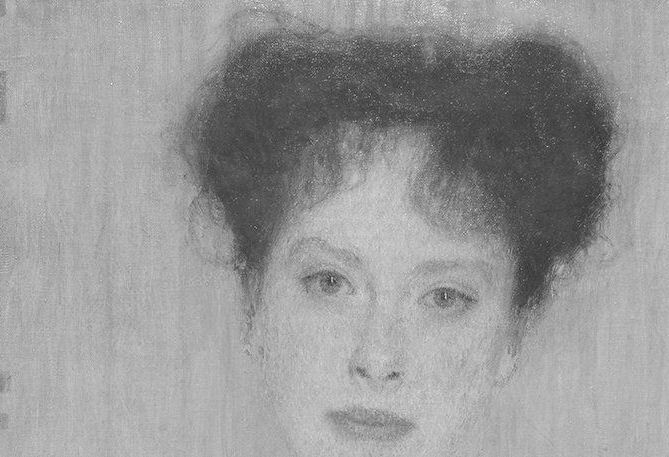 The author notes that this early photograph shows that “Klimt later reworked the background”. 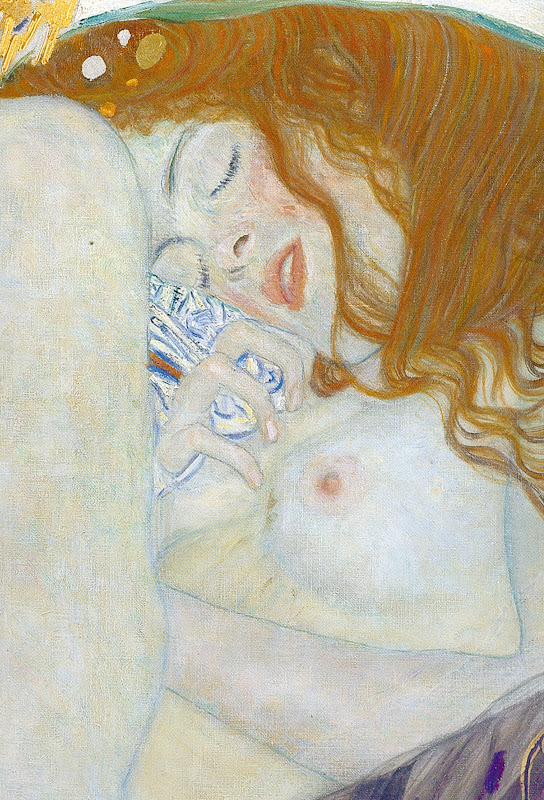 Acknowledgment is given that “Klimt made no alterations to the figure itself”. This being the case, why then is there no discussion of the subsequent restoration changes to the figure? Above all, why is there is no word on the subsequent incremental washing away of the figure’s (recorded) original values that is shown below throughout the sequences of photographs at Figs. 13 to 16 and Figs. 23 to 25? 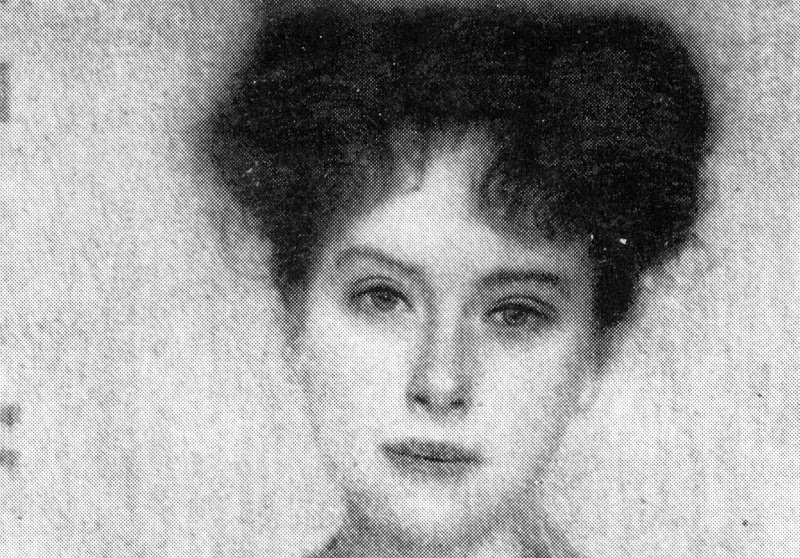 As with Renoir, there is more interest in the feminism and the sociology of the time than in today’s state of the work of art itself: “This lively, intelligent lady who was described by her sister as being amazingly active, with an exceptional mind and rejecting any form of convention, could not recognize herself in Klimt’s portrait. 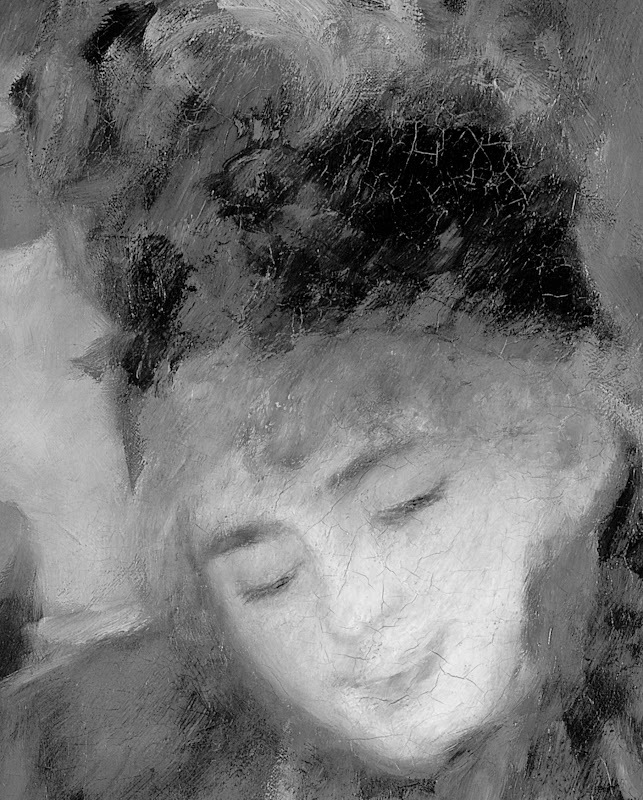 Here, she is shown removed from reality, captured in ornamentation, frozen.” Again, as in Renoir studies, the scholar is attentive to frocks, noting that Klimt “depicted the young lady with great virtuosity in a velvet moiré dress and silk scarf. 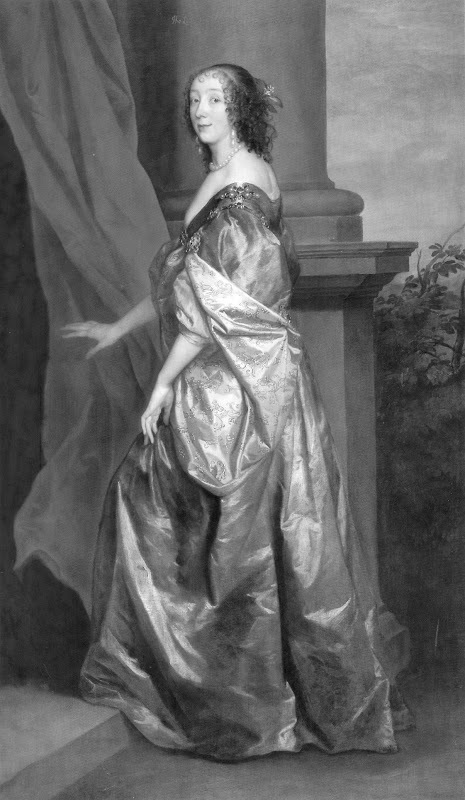 The pleats of her dress are shown in sophisticated nuances of grey which give an impression of the structure of the fabric.” Then follows a plaint that “The billowing lengths of material clothing the figure make it impossible to recognize any corporeality beneath them”, seemingly not noticing that a century earlier there had been a markedly greater sense of interior corporeality. Above, Figs. 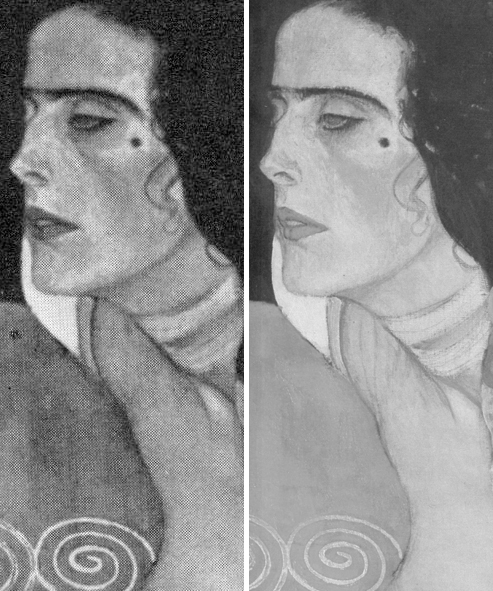 11 and 12: The joint illustrations to the entry in the 2007 book Gustav Klimt, Prestel Verlag (Munich, Berlin, London, New York), on Klimt’s 1905 oil on canvas Portrait of Margaret Stonborough-Wittgenstein, as shown in colour and, here, converted into greyscale. With the colour reproduction at Fig. 11 converted to the greyscale version at Fig. 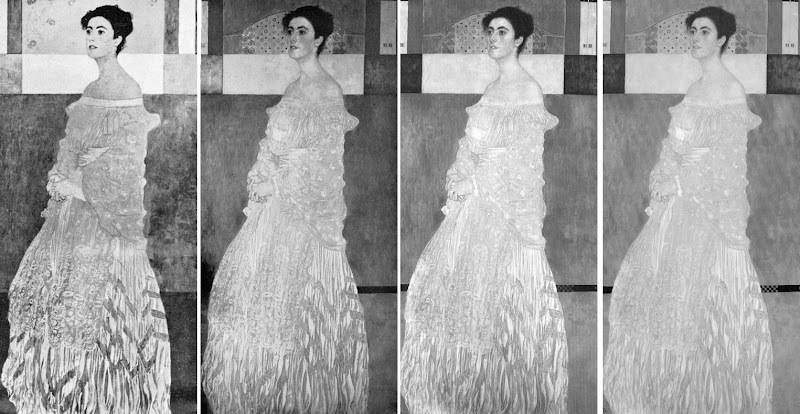 12, the extent of the losses in the painting of the dress as seen in 1905 and in c. 2007 is manifest: the darks in 1905 were darker and the lights were lighter. Within this greater tonal range Klimt had disposed his forces to masterly and vivacious effect. The picture’s strongest contrasts at the head were better balanced by the escalation of contrasts towards the bottom of the dress, the treatment of which, truly, was a painterly tour de force. Below: the sequence of same-size, all greyscale, photographs charts the progressive debilitation of values and diminution of pictorial vivacity that has occurred in this painting within a century. One can only shudder at the prospect of another hundred years of conservation treatments in which the corporeal is converted to the ethereal. We can see for example how much the progressive lightening of the background and floor has robbed the figure of its former “relieving” support. Has no one asked why the strategically dynamic pool of darkness in the bottom left hand corner has been removed when it was present in the photographs of 1905, 1911 and 1956? 2012, Klimt ~ The Complete Paintings, Tobias G. Natter (Ed. ), Taschen, Cologne. 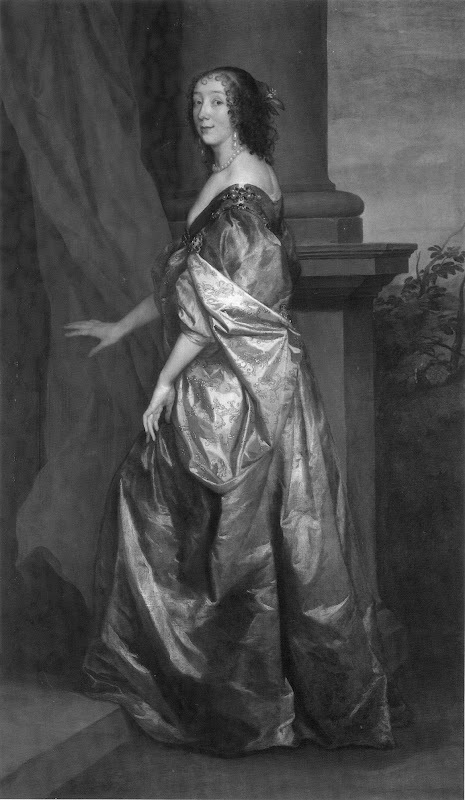 Above, Figs, 17 and 18: Van Dyck’s portrait Lucy Percy, Countess of Carlisle. Fig. 17 (top) is as reproduced in the Tate Gallery’s 1992 catalogue to the 1992-1993 exhibition organised by Andrew Wilton, “The Swagger Portrait”. Fig. 18 (above), is from the catalogue to the Tate Gallery’s 2009 exhibition, “Van Dyck in Britain”. Above (top) Fig. 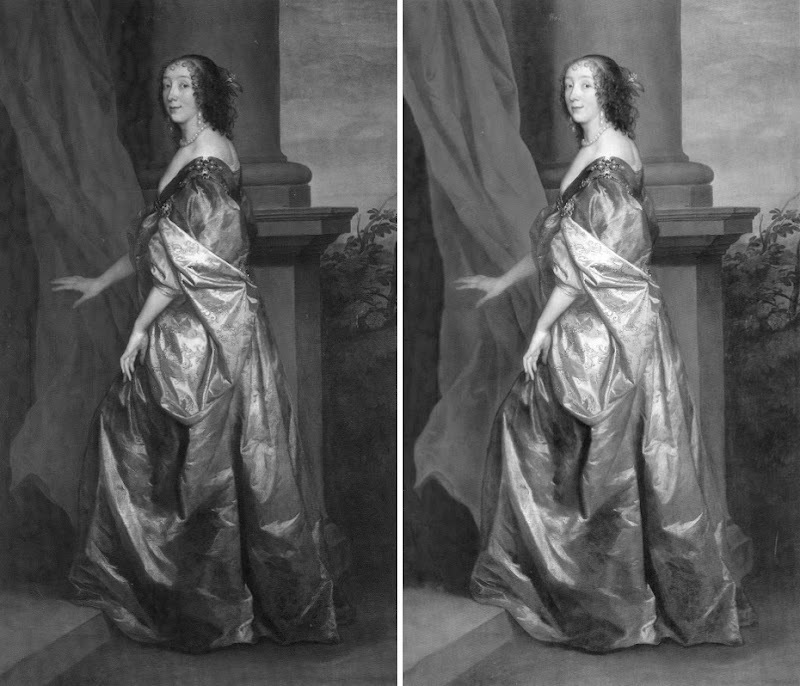 19: Two recently published states of Van Dyck’s portrait Lucy Percy, Countess of Carlisle. Above, Fig. 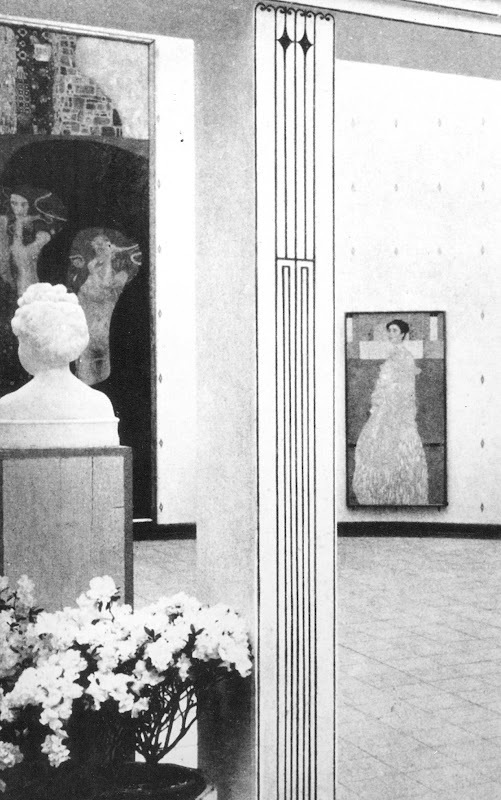 20, a detail of a view of the Klimt Room at the International Art Exhibition in Rome, 1911; showing on the walls Klimt’s Jurisprudence and his then finished Portrait of Margaret Stonborough-Wittgenstein. From the catalogue of the exhibition, 1911. We mention scholars’ neglect of condition in favour current obsessions with the sociological and with feminist correctitude, but it sometimes seems there is imperviousness, even, to the self-validating clout of sheer artistry. One after another offers “grounds” for the dissatisfaction felt by Margaret Stonborough-Wittgenstein and her family with the portrait. 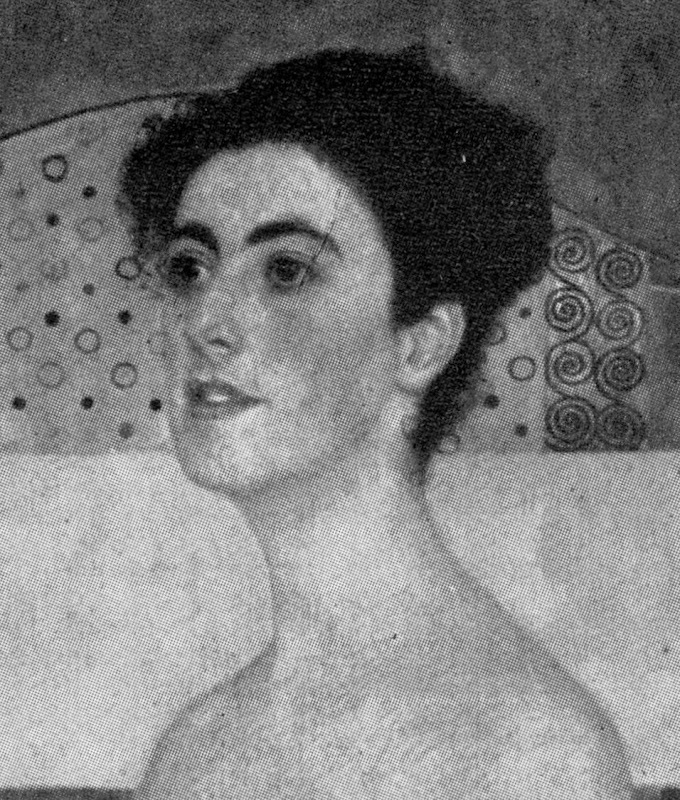 Thus, Susanna Partsch, in her Klimt ~ Life and Work of 1989, notes: “Margarethe Stonborough-Wittgenstein is known to have possessed a good measure of self confidence, but Klimt saw her differently, He applied ‘his’ view of woman to her, and had to accept that the result did not please her.” It may not have pleased her, but affront today at a male artist’s (perceived) imposition of ‘his’ view of woman onto the subject is a politicised indulgence. How the subject might have preferred to see herself may be a matter of some interest, but more so for a novelist or a social historian, perhaps, than for a historian of art who has at hand the artist’s material artefacts that were intended to carry all necessary information and thereby avoid need for speculation. Besides which, it is quite possible that the source of dissatisfaction was something altogether smaller (and less mentionable). Perhaps the subject and her family did not welcome a too-heavy evocation of down in the shading over the upper lip as it turned from the viewer (see Figs. 27, 28 and 29)? 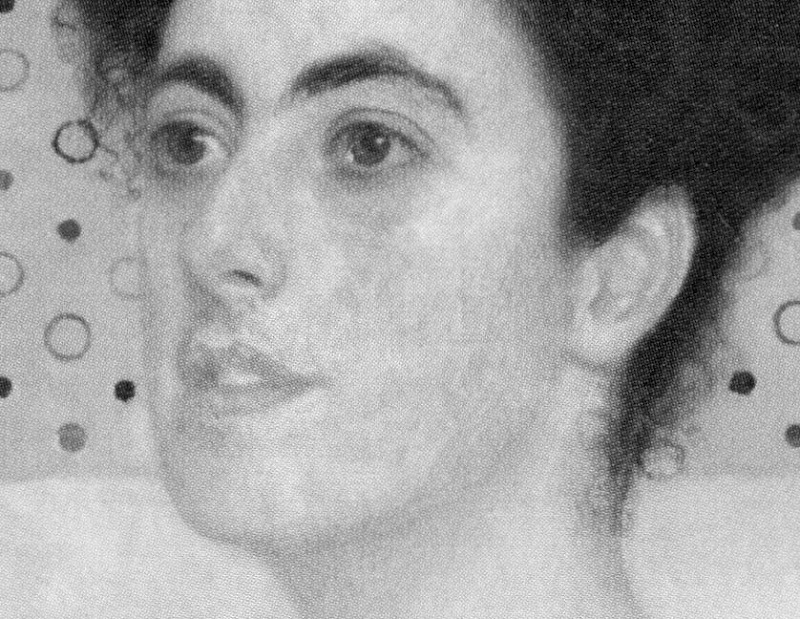 A hint of such had been present in the more frontal 1899 portrait of Serena Lederer. The reported feelings of the subject herself aside, the drawing in this portrait was brilliant. Even at this historical distance – and notwithstanding restoration vicissitudes – this portrait stands remarkably fresh, sympathetic and respectful. We see and sense intelligence, brightness and alertness to the world. She is depicted not lustfully but with grace, self possession and dignity. If the opulent, massively High Fashion Statement skirt on her dress is put aside and consideration given to the upper half of the figure, its sculptural presence is quite astonishingly accomplished and attractive (see Figs. 23, 24 and 25) – albeit in bas relief, so to speak, so as to relate more comfortably to the emphatically flattened and decorated background. 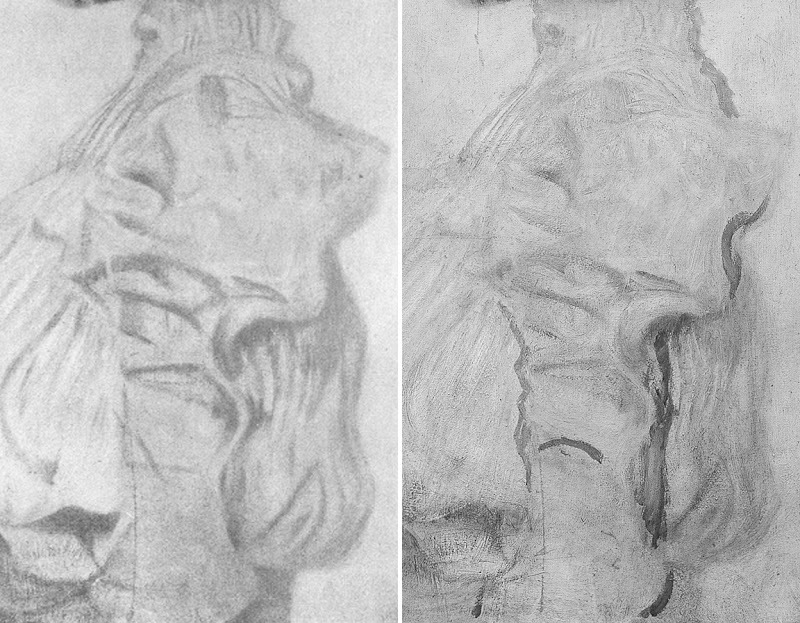 In its drawing, this upper figure recalls – and could live in the company of – Holbein’s portrait of the young Anne Cresacre (Fig. 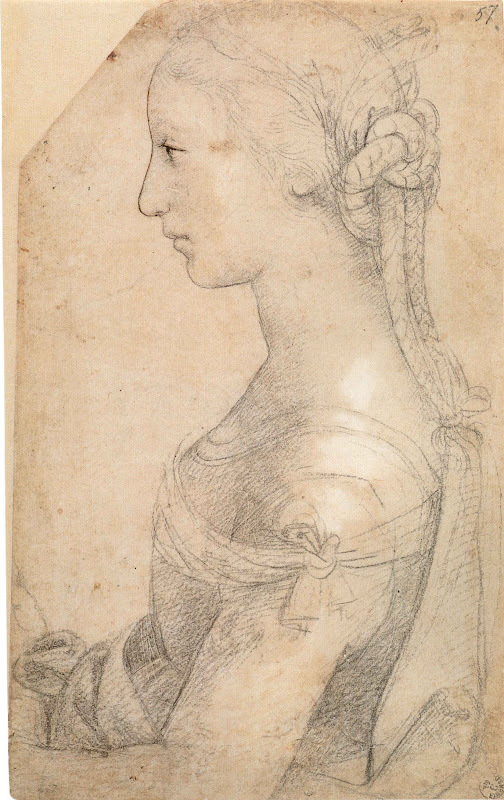 22) and even the more luxuriantly plastic (now) Raphael portrait of a young woman in profile at Fig. 21. Of how many 20th century portraits might such parity be entertained? In truth, the sense of the body within the costume is subtly but superbly evoked. The massive tulip-shaped skirt certainly conceals the legs – but then who bought and wore this dress? Was the subject making no statement of her own? Did she not dress heself? Partsch observes that the “bearing and facial expression make her seem cooly aloof with an air of expectancy, but also far removed from reality.” But removed from which or whose reality? Should Klimt have set her in an oppulent domestic interior? Did this very rich, culturally privileged and intellectually aspirational young person never betray a degree of aloofness? Was she quite without social expectations and sense of entitlement? On what grounds does one scholar after another complain of the in-corporeality of the body underneath the costume? Partsch once more: “Again the human figure takes up almost the entire picture. The principles which Klimt had developed since the painting of Sonja Knips have been sustained. Again the figure is veiled in a long dress, revealing only head, shoulders and hands. 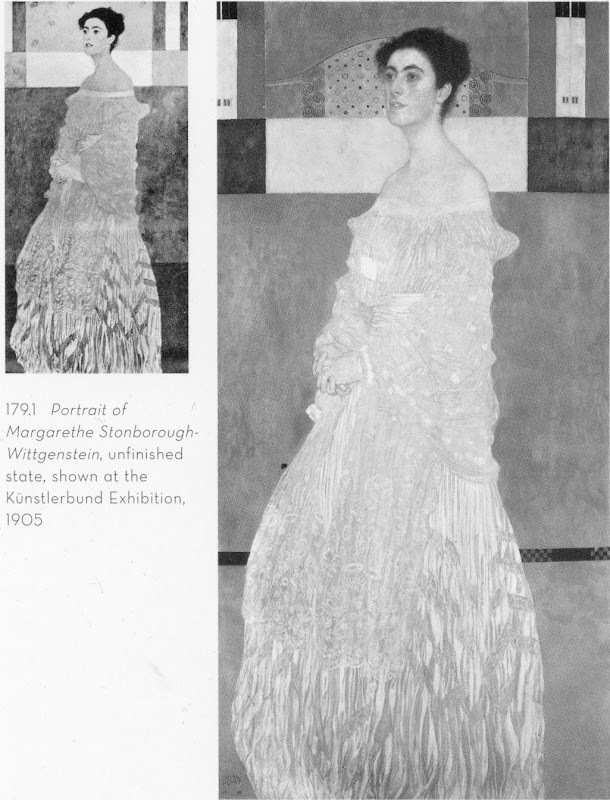 This time it is a dress of white moiré velvet that negates the corporeality of the human figure, and again the dress reaches right down to the ground and is cut off by the frame in the vicinity of the feet.” And how is it that so many avid connoisseurs of the corporeal should miss the fact that, in Klimt, this very feature is diminished every time his works go into the conservators’ wash? Above, Fig. 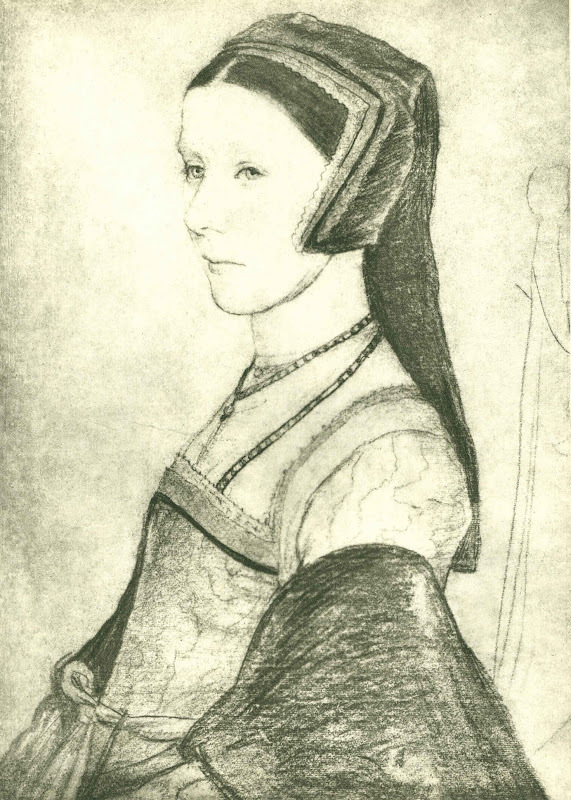 22, Holbein’s 1527 drawing of Anne Cresacre (reversed). Above, Figs. 23, 24 and 25: Details of Figs. 14, 15 and 16 – and so, from no later than: 1956; 2000-01, and, 20012 respectively. BELOW: IT’S A WASHOUT – IS IT NOT? Above and below, Figs. 26, 27, 28 and 29: Details of Figs. 14, 15 and 16 – and so, again, from no later than: 1956; 2000-01, and, 20012 respectively. 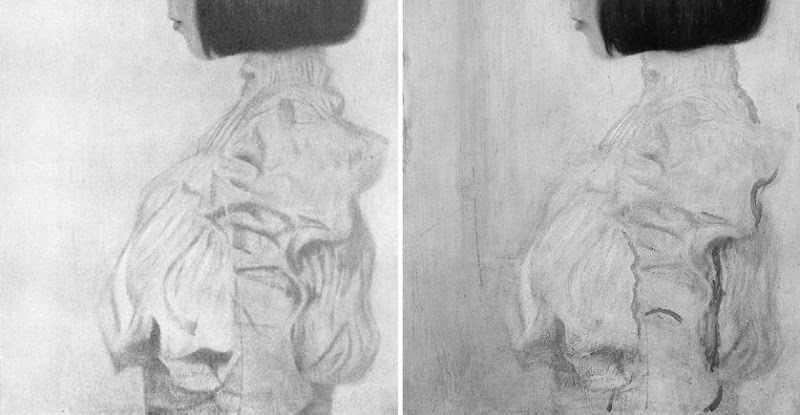 The sequence of three states of the head shown above and below shows why commenting appropriately on the qualities of the portrait made by Klimt in 1905 can no longer be done solely on the basis of the painting as it is encountered today. Klimt’s last intended word has departed involuntarily. What is left is an impersonation of the now lost original and superior state. We should not appraise or speak of the present work without reference to the testimony of its photographic history. For such reasons it is a matter of urgency that the full photographic record of Klimt’s work be assembled and made available to all scholars and art lovers. If we were talk about the portrait today on the selection of three reproductions above, to which image should greatest credence be given: the most recent, the earliest, or the one in the middle? It is not really a difficult question to answer – is it? Graphically-speaking, the three images resemble successive states of an etching – but here with the states running in reverse with less material to hand, not more, at each stage. If we analyse the changes to the original in detail, we can see for example that the mouth/nose relationship has been mangled by restorers. 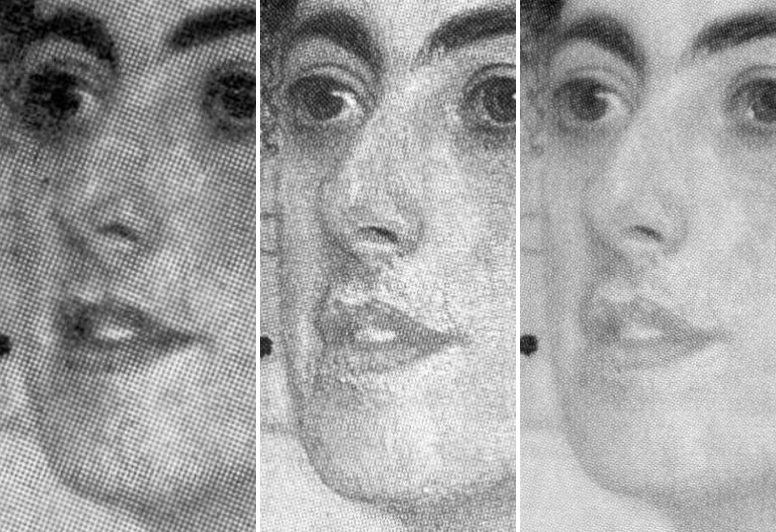 Assuming that no injury had occurred before the first recorded state (when the painting was no more than fifty years old), we can see among many losses and alterations that the design of the nostril aperture was altered from its original sharply turned upper contour to a blander formulation. Such differences are immensely significant in terms of expression. The greatest student of the pinched, translucent, breathing nostril in women was Rubens. Klimt was very good at and attentive to nostrils. He was also good at mouths. Both are products of astonishingly complex anatomical forces (see Fig. 34 for an entirely unrestored graphic attempt by the author to grapple with just such plastic complexities). Here we see that by 2000/01 the mouth had met with an accident. Both the upper and the lower lip had been garbled in restoration. The loss of definition in the relationship between the lower lip and its surrounding surfaces has resulted in a most unfortunate appearance of an emerging ‘Hapsburg Lip’, the product not of some physical deformity but of an anatomically illiterate restorer who reconstituted beautifully nuanced tonal modelling as a crass, plastically misread linear simplification. More recently, attempt has been to mitigate the previous errors but the general washing-away process continued. Such rapid undoing and redoing of botched restorations is a growing phenomenon, even at the highest levels of the “museum community” (see Fig. 40). Above, Fig. 30. Note: we are straining below at the edge of enlargements of details of the record as published. Imagine how much more eloquently horrific this comparative investigative exercise would be if we were able to work from high quality copies of the original photographs. Above, Figs. 31, 32 and 33: Details from no later than: 1956; 2000-01, and, 20012 respectively. Above, Fig. 34: a detail of a caricature drawn by the author for the Independent on Sunday. Below, Fig. 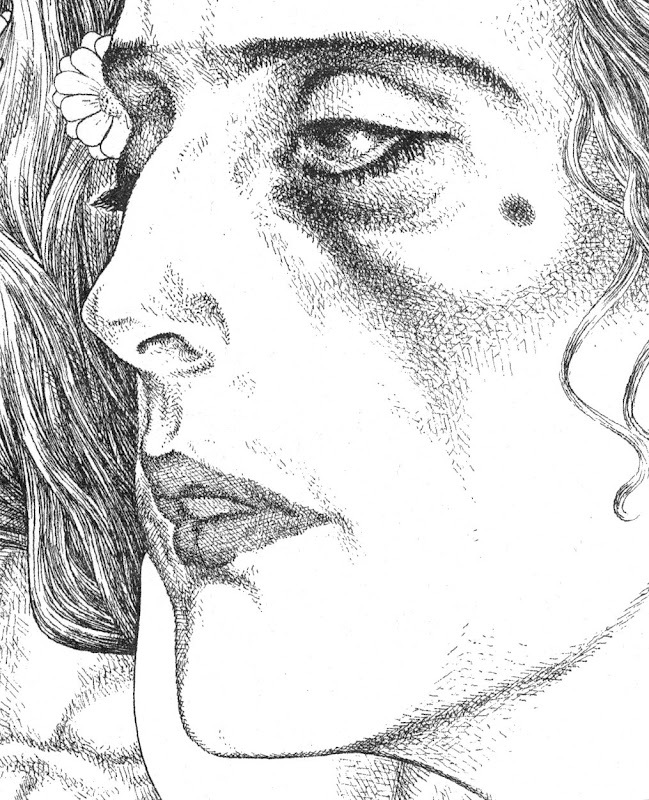 35: a detail of a paraphrase of Klimt’s Judith II (Salome) made by the author in an illustration for the Independent, 3 June 1992. 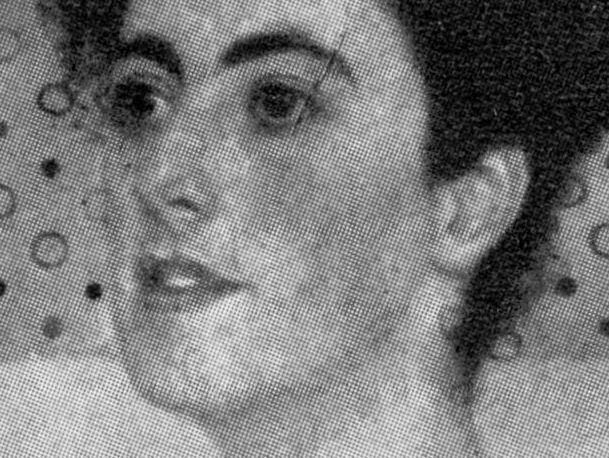 Note the similarity of the arched nostril apperture and upturned nose with that seen in the painting of Margaret Stonborough-Wittgenstein until 1956. 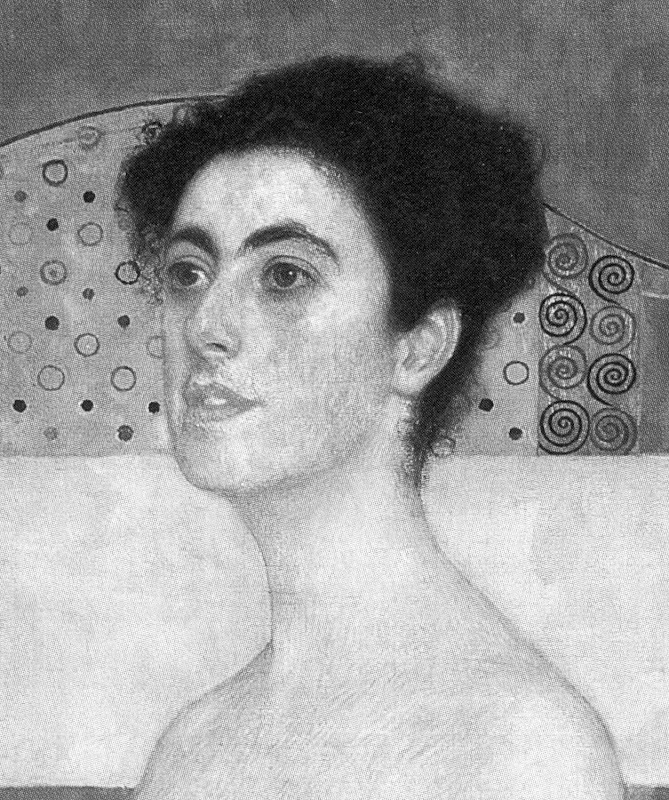 It has been claimed, however, that the model for both of Klimt’s Judith paintings was Adele Bloch-Bauer – see Susanna Partsch, Gustav Klimt ~ Painter of Women, p. 78. 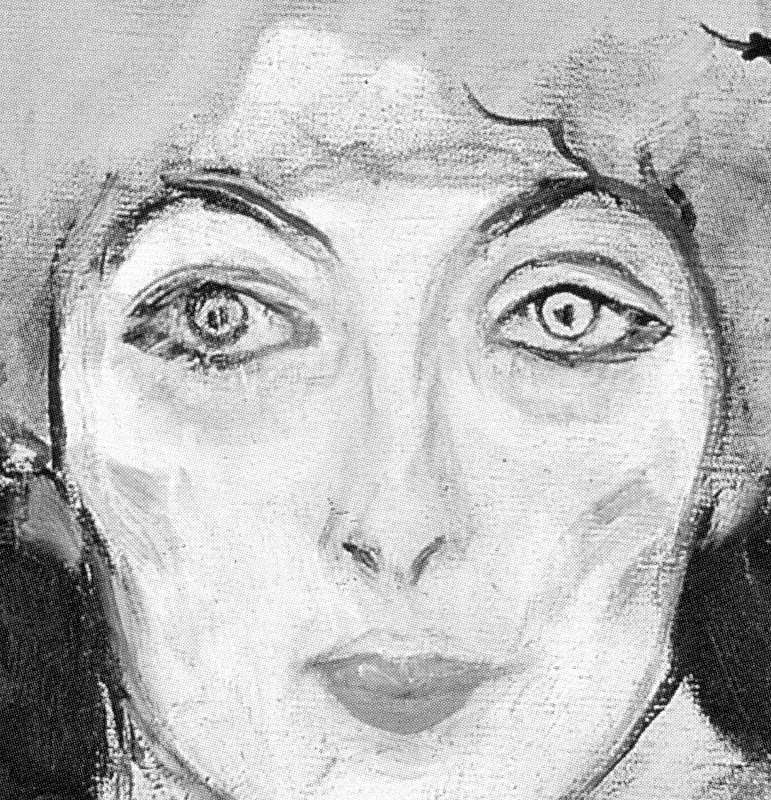 Even as a young woman, Bloch-Bauer did have markedly heavier eyelids – perhaps Klimt was fusing features from different models when composing invented characters? Above, Fig. 36: A detail of Klimt’s Judith II (Salome) of 1909, as published in 1956 (left) and in Angelica Bäumer’s 1985 Gustav Klimt ~ Women. Above and below, Figs. 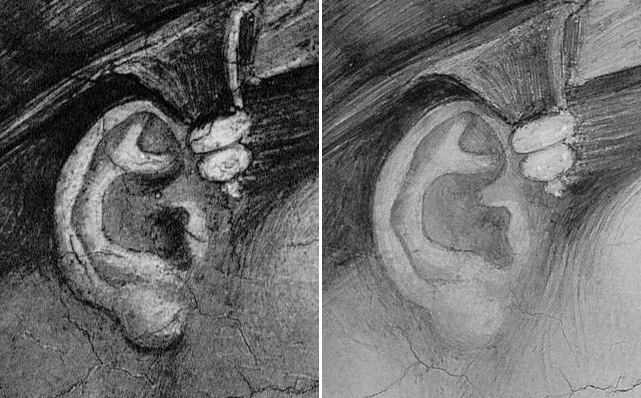 37, 38 and 39: The ear from Michelangelo’s Erythraean Sibyl on the Sistine Chapel Ceiling, before and after cleaning. Those responsible for the losses in the Sistine Chapel claimed in response to criticisms that the disappeared material had not been Michelangelo’s own finishing adjustment but arbitrary accumulations of centuries old dirt, soot and restorers’ glues. 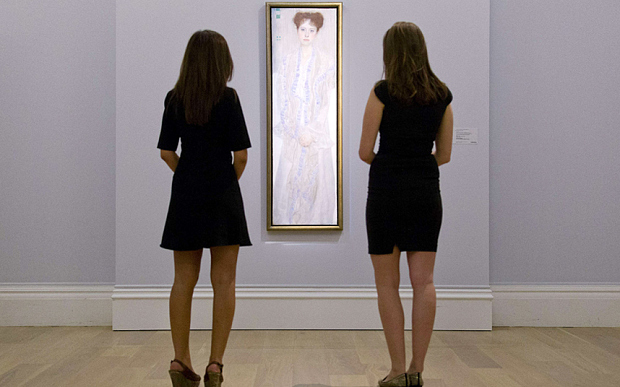 Klimt’s restorers are luckier: the losses have yet to be acknowledged. 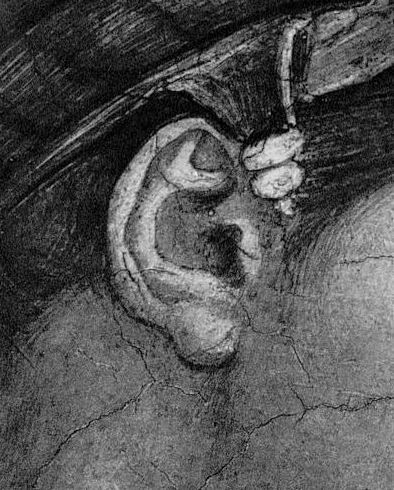 Morelli famously held that attributions lay in the details of figures – ear lobes, finger tips and such. 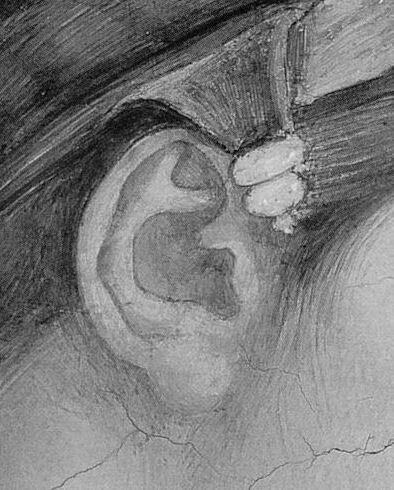 Which of Margaret Stonborough-Wittgenstein’s ears might best now be taken as carrying the fingerprint of Klimt – the earliest, or the most recent? Above, Fig. 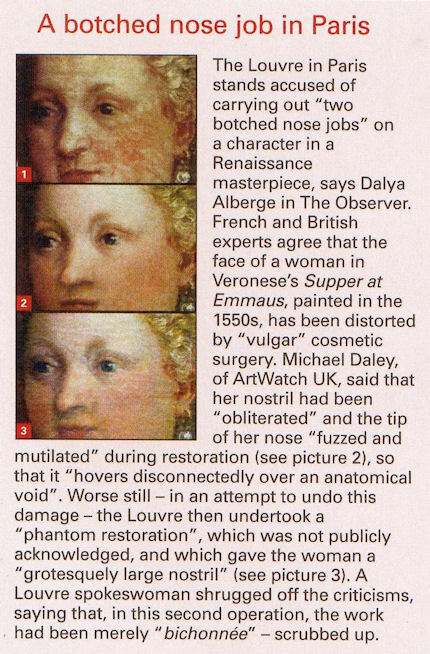 40: The Week’s summary of Dalya Alberge’s June 13th 2010 Observer article “Louvre masterpiece by Veronese ‘mutilated’ by botched nose jobs”. Fig. 41: “Two employees of Sotheby’s auction house pose by a portrait of Gertrud Loew (Gertha Felsovanyi) by Austrian artist Gustav Klimt painted in 1902” ~ The Daily Telegraph 19 June 2015. On June 5th we examined the photographic record of Klimt’s 1902 painting of a young Jewish woman (Gertrud Loew) that had been restored to the heirs of her family (Now Let’s Murder Klimt). Despite its manifestly degraded condition (see below), the portrait sold at Sotheby’s on June 23rd for £24.8m (on a £12-£18m estimate). The July/August Art Newspaper attributes the high price not to the picture’s condition – which it does not discuss – but to the history and poignancy of its backstory which Sotheby’s held to have “added to its value” (“The Lure Of A Backstory”, The Art Newspaper, Section 2, p.12). Restoring works to families whose forbears were robbed and murdered is an indisputable good. Questions of ownership, however, like questions of attribution, are less urgent than questions of condition. Whatever their gravity, ownership or attribution disputes might always be resolved at some future point. With restorations, injuries are irreversible and cumulatively compounding. Nothing might now return Gertrud Loew to the beautifully nuanced condition in which she was bequeathed to posterity by Klimt. Above, Figs. 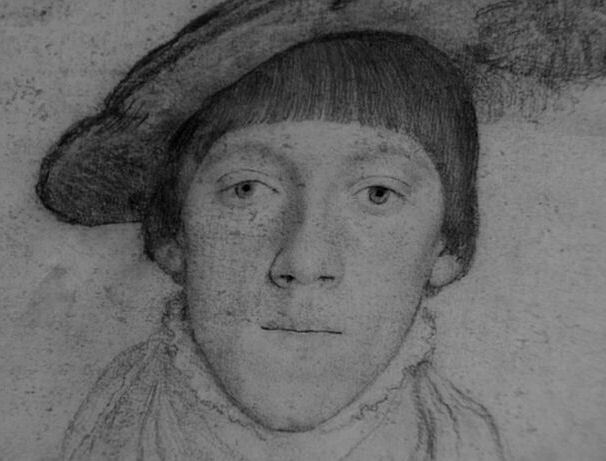 42, 43 and 44: (Top) Holbein’s portait of the fifteen years old Henry Howard. (Centre) Klimt’s 1902 portrait of Gertrud Loew, as seen before 1956, and (above), as seen today. Note, among many alterations, how the definition of the eyebrows and the shading around the eyes have been debilitated. 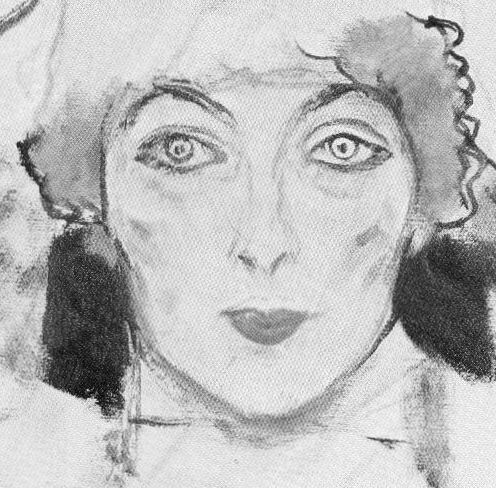 Note, too, how changes to the line of parting in the lips have altered the subject’s expression; how an eyebrow has been cocked; how the eyes are now open wider. Note how the loss of shading at the sides of the nose makes the present nose larger than its original self. Note how credibly and well this portrait once lived in the company of Holbein’s full-on portrait of the young Henry Howard and ask if this picture might not have had the mother-of-all ‘cosmeticising’ restorations? Perhaps it’s backstory is richer than Sotheby’s and the Art Newspaper have appreciated? 1) In the massive, ambitious and welcome 2007 book Gustav Klimt, the editor writes: “It was a major concern of ours to see, as far as possible, all Klimt’s paintings in the original, and to take new photographs of all them.” With so many recent photographs of Klimt’s works the authors’ were perfectly placed to make comparative studies with the earliest photographs. As seen above, one such a photographic comparison was made with a portrait to show the differences before and after its completion. So why not show some, if not all, of the earliest visual records against their most recent counterparts? 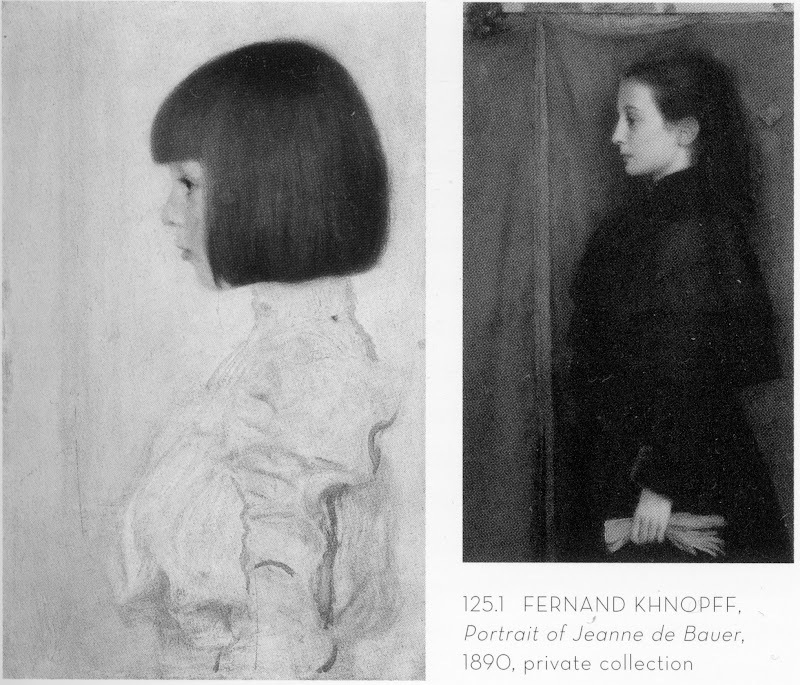 In the catalogue, another photo-comparison is made with with Klimt’s portrait of his niece Helene – but this is with a portrait by Fernand Khnopff, and not with the picture’s own earlier recorded self. This was a terrible lost opportunity: as shown below, there are such great differences between the Helenes seen in 1956 and in 2007 as to suggest the existence of two versions of the portrait. There are dramatic differences of design in the dress. In 1956 the lightest part of the hair was at the crown and the back of the head. The hair got progressively darker as it ran down and as it approached the girl’s face, which it emphatically framed. That logic has been reversed. The darkest part is now at the crown and the hair lightens as it approaches the face. Above, (top) Fig. 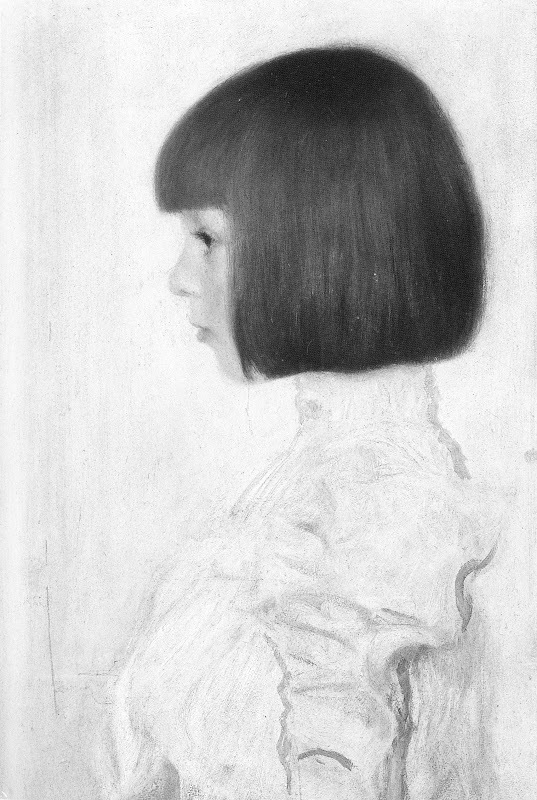 45: Klimt’s portait of his niece Helene in 1956. Above (centre) Fig. 46, showing the niece as seen in 2007. Above, Fig. 47: The juxtaposition of photographs of Klimt’s and Khnopff’s portraits made in the 2007 Gustav Klimt catalogue. Below, figs. 48 and 49: Further comparisons of Helene’s drapery. 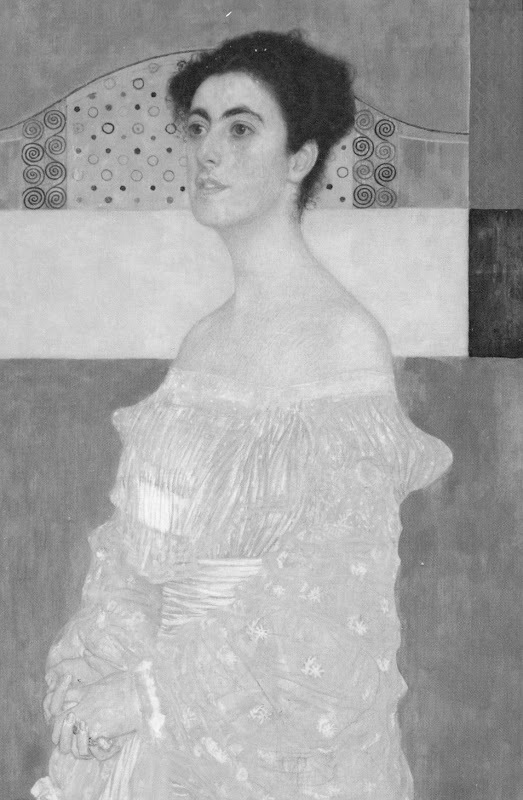 Does the treatment of the drapery now present (above, right) on this privately owned work on loan to the Kunstmuseum, Berne, seem worthy or typical of Klimt in 1898? 2) In a recent BBC “Fake or Fortune” television programme the resident art sleuths faced the challenge of proving that three small Lowry paintings (all of which which carried labels and numbers on the back from the reputable gallery that had sold them) were authentic Lowrys even though the present owner had no paperwork showing right of ownership. What proved to be the programme’s MacGuffin was the presence in the paintings (revealed by technical analysis) of the wrong kind of white paint – zinc not lead. To surmount this hurdle the sleuths examined old photographs of Lowry at work in his studio. A bit of digital enhancement of one showed a whole boxful of the ‘wrong white’ in use. The question still to be resolved still was whether these labelled, numbered paintings really were Lowry paintings. Another old photograph of Lowry’s studio was found to show the three presently ‘homeless’ paintings. When a small image of one of the paintings was digitally enhanced and superimposed over a photograph of the painting today, it proved a perfect match, “brush stroke by brush stroke”. This accumulation of photo-evidence was taken to be so clinching that it trumped both the potentially lethal absence of any paperwork and the scientifically established presence of a ‘wrong’ pigment. When the Big Four Lowry experts were duly assembled to examine the three paintings (away from the cameras) they emerged after a couple of hours to give the trio of paintings the thumbs up. And so, it was photo-evidence that carried the day, not science, not documents. Things might, however, have been very different had the Lowrys been restored to the point where their brushmarks no longer coincided with those recorded in the artist’s studio. 3) At the 2011 ICOM conference in Lisbon, two conservators complained in a joint paper (“To Err is Human: Understanding and Sharing Mistakes in Conservation Practice”) that because a belief exists that it is unacceptable for conservators to damage objects, members of the conservation fraternity are hampered in their desire to make a “collective acknowledgement and sharing of mistakes”. The experience of other fields, such as medicine and aviation, it was explained, demonstates the value of admitting and sharing errors so as to “reduce the risks of their occurrence”. This proposal/demand will be discussed in the Autumn issue of the ArtWatch UK Journal by Michel Favre-Felix, the president of ARIPA (association for the respect of the integrity of artistic heritage).